The book begins as Alice is sitting with her pet kitten, Kitty, who is playing with a ball of string. 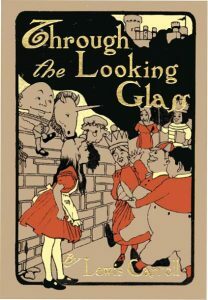 Alice tells Kitty a story about “Looking-Glass House,” a magical world on the other side of the mirror where everything is backwards. Suddenly, Alice finds herself on the mantel piece. She walks through the mirror and she is in Looking-Glass House. She sees that she is in a room quite like her own, but slightly different. There are chessmen standing in pairs on the fireplace and Alice comes to the aid of the White Queen’s daughter, Lily, but the chessmen seem to be unable to see her. She finds a poem called “Jabberwocky” which is complete nonsense and this frustrates her, and he decides to explore the rest of the house. She finds a magnificent garden and follows the path into the garden. Strangely, every time she follows the path through the garden, she ends up back at the door to the house. In her frustration, she wonders aloud about how to make her way through the garden and to her surprise, a Tiger-lily responds. The other flowers begin to speak, and a few of them are rude to Alice. She learns from the flowers the Red Queen is near and Alice goes to find her. When Alice meets the Red Queen she engages in a conversation. The Red Queen keeps correcting Alice’s etiquette. Alice then notices a chess game being played and tells the Red Queen she would like to play. The Red Queen tells her she can be a White Pawn and if she makes it to the end of the game, Alice will become a queen. Alice suddenly finds herself on a train. She is with a Goat, a Beetle, and a man dressed in white paper. They complain and are rude to Alice until the train comes to a sudden stop. At this point, Alice realizes she is in a forest talking with a Gnat the size of a chicken. The Gnat explains the various types of insects that live in Looking-Glass World. As soon as Alice has learned about all of the insects, she realizes that she cannot remember the names of anything, including her own name. In her state of forgetfulness, Alice encounters a Fawn who cannot remember anything either. The two set out together to find a way through the forest. As Alice and the Fawn find their way out of the forest, their memories returns, and the Fawn becomes afraid of Alice and runs away. Alice presses on and eventually meets a pair of portly men who happen to be identical twins. Their names are Tweedledee and Tweedledum. Alice asks them repeatedly for directions, but they ignore her and instead recite a poem. They happen to notice that the Red King is asleep nearby, and they explain to Alice that she only exists as part of the Red King’s dream. She is a figment of his imagination. This upsets Alice at first, but she eventually dismisses the things they say as complete nonsense. Tweedledee and Tweedledum begin to fight over a broken rattle, when an enormous cow intervenes which sends the twins running away. Eventually Alice finds her way to the White Queen who explains the time runs backwards in Looking-Glass World. As they are talking, the White Queen bandages her finger, but soon she again pricks her finger on a broach. The White Queen explains to Alice that she has spent her days trying to practice the impossible. At once, the White Queen is transformed into a Sheep and they are suddenly in a shop. Alice is deeply confused when the Sheep asks her if there is anything she would like to buy. Alice looks around and although the shop is indeed full of things, Alice cannot focus on any one thing at a time. The sheep asks Alice if she knows how to row a boat and Alice suddenly finds that she and the Sheep are in a boat rowing down a stream. The boat abruptly crashes into something. As Alice tumbles across the ground she sees that she is back in the shop. Alice decides to buy and egg, but as soon as she does this, the Sheep puts the egg up on a shelf. Alice suddenly sees that she is back in the forest and the egg has been transformed into Humpty Dumpty. Humpty Dumpty sits on his wall and tells Alice that her name does not mean anything. All things, he says, should have a name that means something. He is rude to Alice, like so many other characters, and tells Alice that he has the power to change the meanings of words. When Alice hears this, she asks Humpty Dumpty if he can explain the “Jabberwocky” poem. Humpty Dumpty does explain the first stanza, but he drifts into a recital of his own poem, and then he suddenly tells her goodbye and leaves. Alice is greatly annoyed at this point. Alice suddenly hears a tremendous noise in the forest and she sees a troop of soldiers and horsemen go by. Alice soon finds the White King. He tells her that Humpty Dumpty has shattered and that he has sent his men to put him together again. The King’s messenger arrives to tell the King that the Lion and the Unicorn are engaged in battle in the town. Alice joins the King and his men to watch the battle. As they arrive at the scene of the battle, another one of the King’s messengers recounts the progress of the battle thus far. The Lion and the Unicorn stop fighting when the King calls for refreshments. The King tells Alice to cut the cake, but each time she slices the cake, it returns to a whole cake. The Unicorn tells Alice that the cake must be passed around first before it can be properly sliced. Alice then begins to serve the cake, but as soon as she starts, they hear another loud noise. When Alice takes notice, she finds that she is again all alone. The Red Knight suddenly appears and takes Alice prisoner. Soon the White Knight arrives and rescues her. Alice and the white Knight talk to each other, and she seems to have found a friend in the white Knight. He promises to guide her to the final square of the chess board so she can become queen. He tells her many strange things and sings her a song as they part ways. When Alice crosses a brook and there is a crown on her head. She passes through the door to find a banquet has been prepared for her. As she sits down to eat, the party descends into total chaos. She becomes overwhelmed, pulls out the tablecloth, and grabs hold of the Red Queen. Alice wakes up in her home holding her kitten. She asks herself if the entire dream was her own or was it the dream of the Red King.